Jamie Oliver is coming to Ovation. Recently, the network announced they’ve acquired the two TV shows Jamie’s American Road Trip and Jamie and Jimmy’s Food Fight Club. MIP TV, Cannes, France: April 10, 2018 Ovation, America’s only arts network, continues to explore the world of culinary arts with three exciting titles set to air later this year. The network has licensed the first season of Jamie’s American Road Trip (6 x 60′) and three seasons of Jamie & Jimmy’s Food Fight Club (16 x 60′) from FremantleMedia International. The deal also includes the documentary Alinea in Residence Madrid (1 x 60′). All three titles will air on the linear network as well as on JOURNY, Ovation’s AVOD travel channel. The announcement was made today by Scott Woodward, EVP Programming, Ovation and Caroline Kusser, SVP, Sales & Distribution for FremantleMedia International, North America. 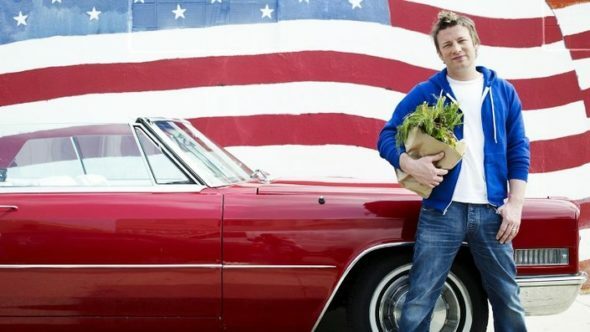 On Jamie’s American Road Trip, celebrity chef Jamie Oliver delves into the underbelly of American society to uncover fascinating personal stories, try real American food and meet the most interesting but unsung chefs and food producers the country has to offer. The epic journey takes Jamie to the heart of America: its people, culture, music and most importantly, its food. Jamie & Jimmy’s Food Fight Club is based in the Southend, Essex, UK café of childhood friends Jamie Oliver and Jimmy Doherty. While Jamie cooks up his ultimate weekend recipes, Jimmy heads outdoors and rustles up magnificent feasts from wild ingredients. The boys are joined by a host of celebrity friends – such as Gwyneth Paltrow, Kate Hudson and Michael Sheen – who pop in to learn how to cook the dishes they’ve always loved. The boys also hit the road, spreading the word about exciting new food campaigns – including delicious mussels, happy milk and the tastiest sustainable fish in our seas. Alinea in Residence Madrid follows renowned chef Grant Achatz as he heads to Madrid with his team to create Alinea in Madrid, a replica of his Michelin three-star restaurant in Chicago. After ten years of being open to the public, the famed Chicago restaurant temporarily closes its doors to reinvent itself and begin a new phase. Achatz has always considered Spanish cuisine a great source of inspiration and so he decides to fly his crew out to Spain to create a unique venture. A world leader in gastronomy, the creative chef will serve some of his iconic creations for the last time while collating new and bold creations to take back to his re-opened restaurant. What do you think? Are you a fan of Jamie Oliver? Will you watch his new shows on Ovation? More about: Jamie and Jimmy's Food Fight Club, Jamie and Jimmy's Food Fight Club: canceled or renewed?, Jamie's American Road Trip, Jamie's American Road Trip: canceled or renewed?, Ovation TV shows: canceled or renewed?